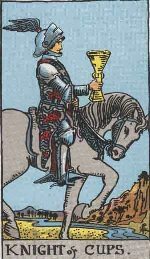 The Knight of Cups is also known as the Lord of Waves and Water. It indicates the fiery feature of water. Fire and water --- the combination appears a bit contradictory. But imagine a person who has shifty moods—happy and giggling in one moment, sad and morose in the other. The Suit of Cups is all about romantic relationships and a Knight- at- arms aptly fits into the area of romance. Imagine a romantic lover changing his moods from becoming sad or happy because his ladylove changes her colors so often. He feels insecure in his love affair and needs to be constantly reassured. The Knight signifies a gentle and romantic young man. 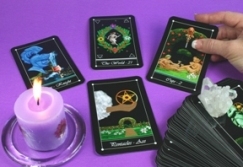 In divination, it represents the same sort of man who is liable to temporary enthusiasms but lacks staying power and dogged determination. 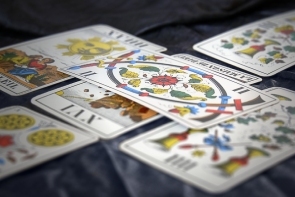 The appearance of this card in a spread means that there is a recent arrival, or the coming of an arrival, of some sort of message or proposition, the general nature of which can be gathered from the significance of the cards dealt immediately before or after it. This card represents a high strung and emotional person. He is a creative and visionary artist—sensitive, sometimes, hyper sensitive and intense. His façade of openness is often misleading.